Airbus announced reduced production of its A380 and A400M. That new production schedule could be affecting 3600 jobs, French daily Challenges estimates. France should be spared, but in Germany, United Kingdom and Spain, workers are expecting some reassignments. The company released a statement that it would meet the European Works Council (a committee in charge of representing the company workers of the four different countries where Airbus is installed) to officially address the consequences of the reduced production. “Airbus is committed to managing any social implications in a responsible manner and has demonstrated its ability to find the best possible solutions for its workforce on various occasions in the past”, the statement says. The factories most affected are those only devoted to one program. 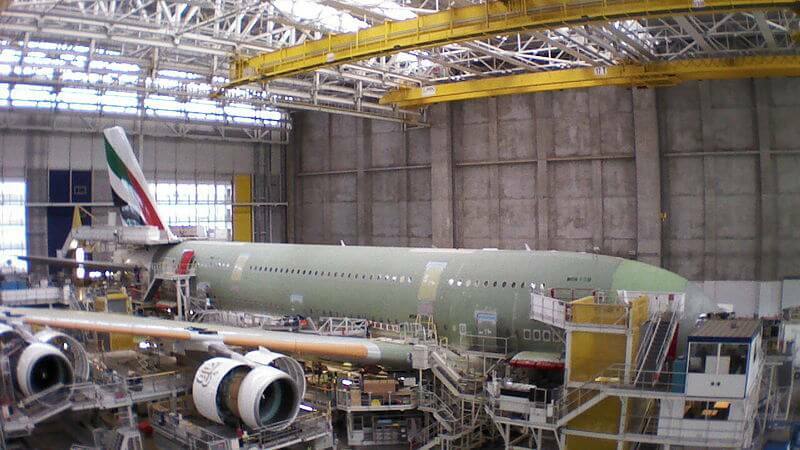 In France, the different sites have been refitted to counter the reductions: in Toulouse for example, most of the A380 assembly line is now constructing A350 to meet the needs of the company. But other factories might have to endure the full blow of Airbus sales problems on some of its models. The sales of the massive A380 have been plummeting throughout the years. From 30 aircrafts produced in 2012, it should go down as low as 6 in 2020, just enough for the company to keep it in its catalogue. Same problem with the military cargo plane A400M: only 26 deliveries are planned until 2019, threatening the factories solely dedicated to it: Seville, Filton and Breme. On February 7, 2018, Airbus had negotiated with the Organisation for Joint Armament Cooperation (OCCAR) a reduced rate of production of the cargo plane in order to avoid a delay that could lead to penalties. So far, the plane has costed over 30 billion euros in development and is still struggling to find new customers outside of the initial partners. Airbus uses temporary workers to keep maneuverability in its workforce. If the 3600 threatened jobs do not lead to direct layoffs, they might however be rotated to other facilities.